The properties of 20-sim models are shown in the Model Properties dialog. You can open the Model Properties in various ways. • Select the proper model in the Model Browser and then click Properties from the Right Mouse menu. • Select the model in the Graphical Editor and then click Properties from the Right Mouse menu. • From the File menu choose the Properties command. • From the Settings menu choose the Model command. • From the Settings menu choose the Submodel command. • Name: Enter a unique name for the model. • Help Page: Enter the location of a help page that should be displayed when you click F1 or Help. • Version: The version number of the model. The version number can be displayed in the background and is included if you generate C-code from the model. In this tab you can find information on location of the model and some important properties. • Version: The version of 20-sim that was used to create the model. • Library Path: If the model was stored in a known library, the path is shown. • Library File: The relative location of the submodel in the library or the absolute location of the model submodel on your computer. • Created: The date of creation. • Main Model / Submodel: Shows if the model is a main model or submodel. • Allow model updates: Allow the Check for Model Updates command to check if there is an update available for this model. • Replace parameters when this model is used to update another model: If you drag and drop a model from the library on top of an existing model, it will be replaced. Select this option if you want the original parameters to be replaced as well. In this tab you can specify a background image for the model. If the model is a graphical model, in the background the image is shown. • None: default, no image shown. • Inherit From Parent: Use the background that was defined one model higher in the model hierarchy. • Static Bitmap: Specify the bitmap file to be used. 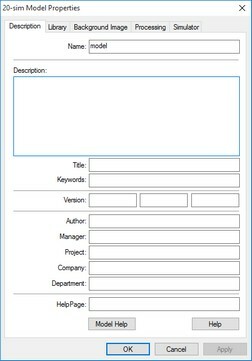 • Script File: You can specify a script file if you want to use a dynamic background. • Scaling: Scaling of the background image. This tab is only available for main models. 20-sim can operate in two modes: Debug Mode and Fast Mode. In this tab you can define settings for both modes. • Model contains algebraic variables: See the section on algebraic loops. • Model contains algebraic loops: See the section on algebraic loops. • Algebraic variables solved: See the section on algebraic loops. • Model contains constraint variables: See the section on constraints. • Constraint variables solved: See the section on constraints. • Model contains dependant states: The model contains differential equations which could not be solved. • Dependent states are transformed: The model contains differential equations which were solved. • Output is not used: Output signals that are not used for connections to other models. • Port is not used: Ports that are not connected. • Parameter is not used: Parameters that are defined but not used. • Matrix is assigned a scalar: A matrix is assigned to a scalar. • Variable is not used: Variables that are defined but not used. • Variable Multiple set: Variables that are assigned a value more than once. • Variable is never given a value: Variables that are never assigned a value. • Variable is set but not used: The variable is assigned a value but never used. • Unit Conversion when SI disabled: Not relevant yet. • Unit Conversion when SI enabled: A unit conversion was found. • Unit missing for variable when SI disabled: Not relevant yet. • Quantities Mismatch: Variables with different quantities are compared. • Unit is unknown: A unit has been used that is not available in the Quantities and Units file. • Equations interpreted as code: Equations can only be valid when interpreted as sequential code. For example when variables are assigned more then once. • Possible loss of data at type conversion: A type conversion has been found that may lead to loss of precision digits. • Type conversion found: A type conversion has been found. • Conversion of booleans found: A type conversions involving booleans has been found. • Transform Dependents States: Try to solve differential equations. • Solve algebraic variables: Try to analytically solve algebraic loops. • Remove Redundant Equations: Try to remove equations that do not influence model behavior. • Optimize Equation Structure: Try to separate equations into an input section, a dynamic section and an output section. • Optimize Static Expressions: Move expressions with constant output throughout the simulation to the static part of the model equations. • Optimize Duplicate Expressions: Calculate and expression only once and use the result everywhere. • Optimize Divisions: Rewrite divisions as multiplications whenever possible. This tab is only available for main models. You can set the simulator properties here. • Initialize variables at start of simulation: You can choose to set any variable that was not given a proper value, to zero at the start of a simulation. You can also choose to set the value to NaN to make detection more easy. • Calculate Hold Instruction During Initialization: Calculate an output for hold functions during the initialization of the a simulation.